Smoothies are an easy way to nourish your body with vitamins, minerals, fiber and protein that are otherwise hard to eat in large quantities– Can you imagine trying to eat a large handful of kale, a raw carrot, half a cucumber and a tbsp of flaxseed in one sitting without the convenience of a smoothie? I don’t think so. Most kids and adults don’t eat nearly enough fruits and vegetables, because it’s freakin’ hard! Just the preparation alone turns into an excuse to just get take-out instead. But, with a smoothie, you can simply throw fruits and veggies in the blender (along with a few other things like yogurt or flaxseed), and have a healthy snack or meal replacement that even kids will think is a treat. A good quality blender is essential for making a good smoothie. My Vitamix turns ice into a fine powder in just seconds, and I never have to worry about ice chunks. If you’re watching your sugar or calorie intake, limit the amount of fruit you use– even just half of a frozen banana is enough to sweeten a smoothie. Stick with mostly vegetables and protein, and consider it a meal replacement, not a mid-day snack. Add your liquid base and ice last (small increments at a time) until you get the consistency you like. Frozen fruit will give your smoothies a thicker consistency without having to water it down with ice. Anytime your bananas start to get to too ripe, simply chop them up and store them in the freezer for a future smoothie. Also, you can save money by buying fruit in bulk with the plan of freezing half of it for smoothies. Spinach is a good start if you’re new to drinking greens. You can really add a lot of it to the blender without an overwhelming taste. I’d be a little more careful with other greens like kale– if you add too much, you may find it a little hard to get down. Although I’ve got some of my favorite smoothie recipes down below, the idea here is to experiment with the foods you already have and create recipes that suite your dietary needs. I’ve found that the easiest way to clean my blender is by rinsing it out, and then filling it half full with hot water and a little dish soap, and then simply let the blender do the hard work. Don’t forget to add a healthy dose of whole foods to your smoothies whenever you get a chance. This is especially helpful for kids who have a hard time eating nutritious food. It’s just so easy to sneak it in there! 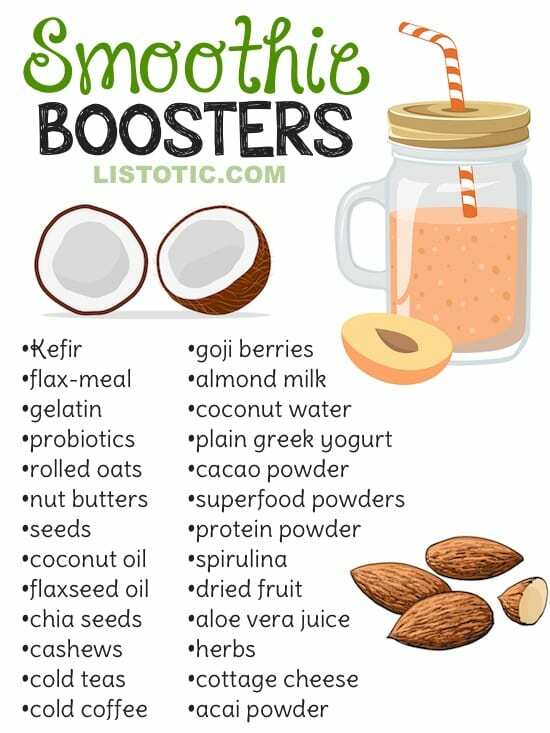 Smoothies can also be a great way to detox the body and even lose a little weight, and that doesn’t mean you will have to plug your nose while drinking them either. 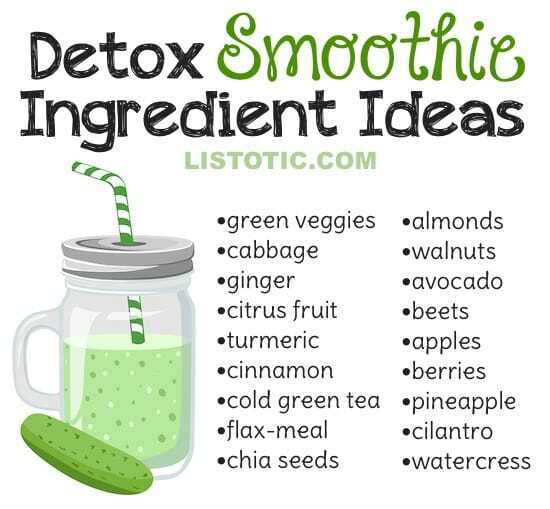 Here is a list of foods that are known for their detox qualities. Consider adding some of these ingredients to your smoothies if you’re looking to cleanse. Because I experiment A LOT with my Vitamix blender (I actually found them refurbished at almost half the cost on Amazon!! ), I’ve put together this recipe graphic of some of my favorite smoothie recipes. The recipe amounts do not have to be exact, in fact, you can completely tailor them to your taste. I encourage you to experiment and have fun with it. I rarely ever measure when I’m tossing things into my blender, I just kind of go with my instincts, but I tried to break it down as best I could.